In the 21st century we shop online, we bank online and we communicate online - so it should be no surprise that thousands of students at UNO and millions across the world are spending more time earning their degrees online as well. The first full week in November is "Distance Learning Week" for the United States Distance Learning Association and, without question, online learning has been one of the major assets for distance learning by helping break down barriers that previously existed preventing people from receiving a quality education. At UNO, online learning began in the late 1990s with a number of blended courses and even fewer fully-online courses. Today, close to 90 percent of UNO undergraduates will take an online course at some point in their degree program. In fact, the university offers 27 fully-online degree or certificate programs across the undergraduate or graduate level. "Online is so well situated to deliver education in new and different ways," explains Jaci Lindburg, Ph.D., UNO's director of online learning. "We don't always have to do the same things we've been doing, we should ask how do we do things in ways that make sense." 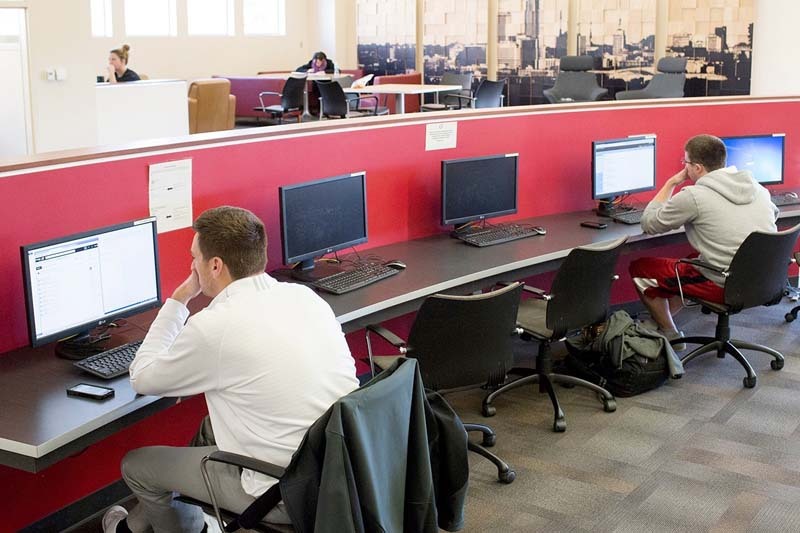 Student athletes are able to make use of the Hamilton Academic Excellence Room on campus for academic support. They also work closely with the Omaha Athletics academic success staff to help them manage their online and in-class course loads. Students have been at the forefront of UNO's move to online learning. Through individual courses or fully-online degree programs, students are able to still learn from experienced faculty at their own pace and around obstacles that may otherwise hold them back. "Some undergrad students aren't really sure which way to go, so before they get to the program level we talk about their needs - financially, with time, with family life, with flexibility and sometimes coursework will play into that," explains Alex Zatizabal Boryca, UNO online program recruitment specialist. "Graduate students want to know a lot about the faculty presenting their program and if the faculty teaching in an online environment are the same faculty that are teaching the on-campus courses and 'yes' is the answer." One example of student success is the work being done by UNO student athletes. Not only do these students have to account for times where they may be competing, but practice times as well, which often impacts what courses they can take and how often they can physically be in class. With online classes, that stress is lifted. "While we do our best to limit that it's inevitable that they are going to miss class," explains Lindey Ekwerwekwu, associate athletic director of academic success and senior woman administrator. "So online classes are great option to play it safe and make sure that they are still staying on track to graduate." And graduation is key for UNO student athletes who are struggling - not because of academic performance, but because of access to the courses they need to complete their degree. "That has played out before, where an online option allows them to take a course they otherwise might not have been able to ... it's a life saver; it's a degree saver," Ekwerekwu says. "It allows them to be a student and an athlete and do both really well." 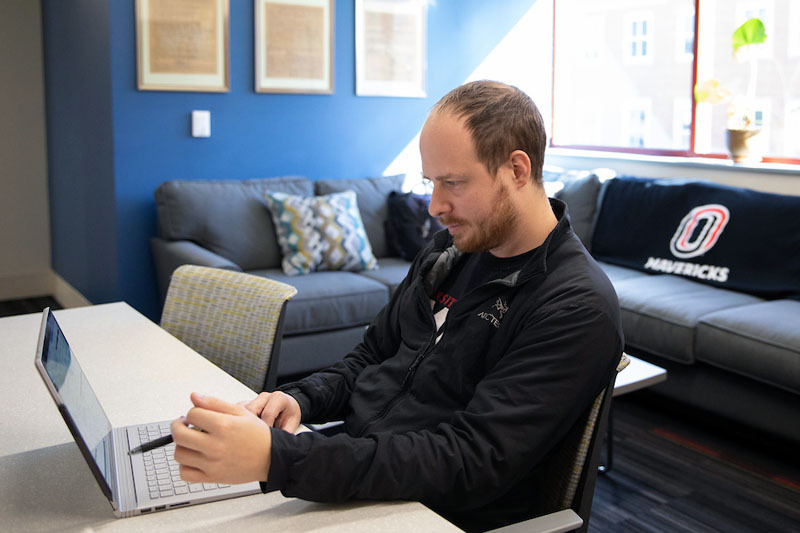 Each academic college at UNO features at least some online courses and many have fully-online degrees or certificates supported by dozens faculty who have become early adopters of online delivery for their courses - but others may not be as eager to make the move. Lindburg says that faculty who maybe were introduced to online learning five, 10 or 15 years ago may not realize how different the landscape is today from what it was back then. "Maybe in the past you would have a vision of what you'd want to do but the technology might hold you back a little bit or it might not always feel the best, but some of these new systems that we've been using are really breaking down barriers when it comes to student engagement and quality." However, online learning isn't limited to courses conducted entirely online; it can also include classroom materials and open education resources, or OER, which available through UNO Libraries in the form of textbooks, articles, worksheets, videos and more - all at no cost to students. Faculty can apply for grants through UNO Libraries to receive help incorporating these assets into their courses. "We really have to ask - is it in our best interest to not respond to what students, locally and nationally, are used to, where the demand is?" Lindburg asks. "For us, for the academy, for faculty and staff, it's seeing this, going out and determining how to deliver a quality education without sacrificing something and, to me, online learning isn't a sacrifice - it's just different." Gina Clyde, a UNO Bachelor of Multidisciplinary Studies alumna, completed her degree entirely online from Norfolk, Neb. while working full time and taking care of two children. Online education at UNO isn't just accessible and innovative, it is also recognized nationally as one of the best in the country. Two of UNO's fully-online degree programs, the Bachelor of Multidisciplinary Studies (BMS) and Master of Criminology and Criminal Justice, have been regularly recognized by U.S. News and World Report. The BMS was most recently ranked at No. 16 for all online bachelor's degree programs and the Master of Criminology and Criminal Justice was recently ranked No. 3 in its field. Both are housed in UNO's College of Public Affairs and Community Service (CPACS). 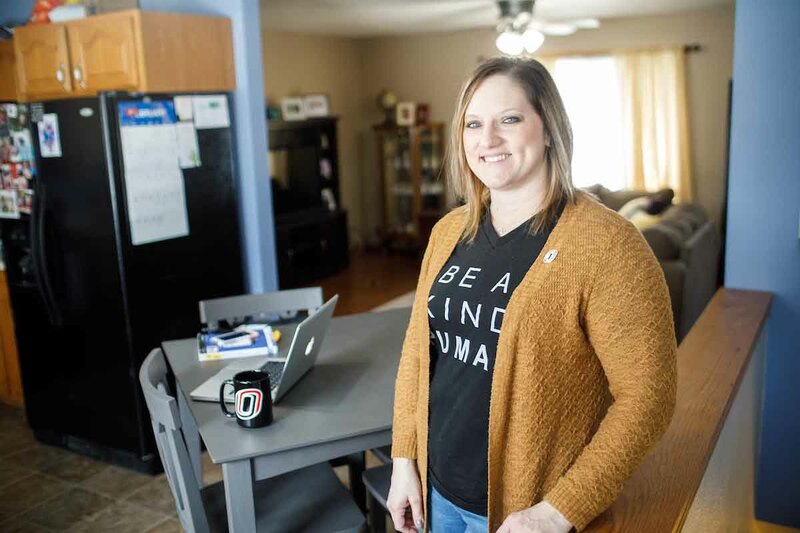 A student who made use of online education at UNO is Gina Clyde, a UNO aluma who was able to complete her BMS degree while working at Northeast Community College in Norfolk and taking care of two kids. With a degree in hand, she was able to argue for a higher salary as a program director at the college. It was something she was glad her daughters could witness first hand. 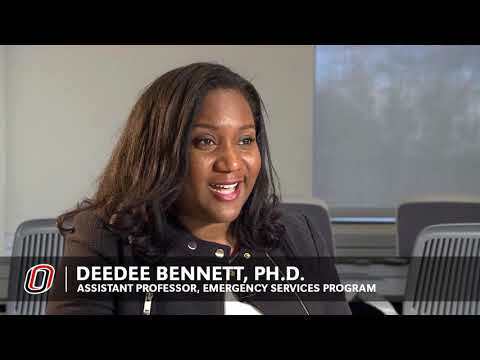 Students who make use of online courses, including degrees that are entirely earned online, are able to make use of UNO support services like the Academic and Career Development Center. UNO ACDC provides online job listing and can also provide interview training services via video conferencing. No matter how familiar students or faculty may be with online education, there is always a need for some form of support. Whether a single student needs help understanding Canvas, or an entire department needs assistance understanding how their coursework can be moved online, there are resources on campus through UNO Online Programs, UNO Libraries and the Center for Faculty Excellence, just to name a few. "The MSLC is prepared to help students succeed in their math and science courses – including students taking courses online," explains MSLC Director Dana Richter-Egger, Ph.D., who is also an assistant professor of chemistry. "Students who are unable to drop-in may call or email. We’ll help them right then if possible or schedule an appointment that might take place over the phone, or through video conferencing using a tool such as Zoom that includes things like the digital whiteboard, screen sharing and other video functions." "ACDC has a plethora of online resources available to students," says ACDC Director Sammi Kaiser. "Two of our biggest resources accessed by online students are Handshake and Big Interview. Handshake is our online job board for current UNO students and alumni. Big Interview is an online and simple-to-use interview training system that combines both expert-developed lessons and the ability to actually practice - all from your home computer. Online students can also request an over the phone or zoom career advising appointment by calling our main office line at 402.554.3672." "Students are always able to access support as distance learners," OMVS Director Leah Meyer says. "We have made our method of intake for any GI Bill or federal benefits digital and have a policy of a one-day turn around, understanding that students in other time zones may have a shortened window of opportunity to engage with staff. Distance learners are on our peer mentor call list, and receive at least one outreach a semester to check in on their academic progress. Deployed students can have their text books shipped to their APO at no additional cost." "Digital learning students can make use of our online writing consulting services, which are handled via our scheduling system, and we attempt to make those sessions as close to in-person sessions as possible, utilizing live chat, an interactive whiteboard as well as audio and video tools," explains G. Travis Adams, Ph.D., UNO Writing Center director and assistant professor of English. "In addition to online appointments, digital learning students are encouraged to use our student resources page, particularly when working on writing after hours. This part of our website is an attempt to provide useful resources either created by the UNO Writing Center or deemed helpful by our staff. These are just a few of the many support services for students and faculty that UNO offers, both on campus and online. A full list can be found on the UNO website. To learn more about Online Learning at UNO, visit unomaha.edu/academics/online-learning.